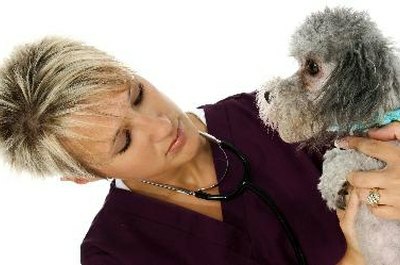 Veterinary care is essential for dogs infected with parvo. Canine parvovirus, commonly referred to as parvo, is one of the most deadly illnesses in young and unvaccinated dogs. Parvo is highly contagious, spreading from dog to dog quickly and infecting soil for years. Quick diagnosis, proper treatment and vaccinations will help your beloved companion survive this devastating illness. Canine parvovirus is an acute, contagious disease originally observed in the 1970s. Parvo affects the entire body, although it mainly affects those cells in the body that reproduce quickly, such as the lining of the stomach and intestines. CVP2, CVP2a, and CVP2b are the three individual strains of parvo, although veterinarians contend that a new strain will emerge as the virus adapts to dogs’ immune systems. Parvo invades cells and replicates, eventually bursting out of individual cells and spreading rapidly throughout the body. The virus kills off the intestinal lining and greatly reduces the bone marrow’s capacity to produce new cells, seriously compromising the dog’s ability to combat the virus. Parvo can be spread by any human, animal or object that comes in contact with the virus. The virus may survive in the ground, on solid objects and in feces for months. Dogs infected with parvovirus most often display vomiting and diarrhea. Some dogs will have no fever, while others may have a temperature upwards of 106 degrees Fahrenheit. Most parvo-positive dogs will have little to no appetite, and will progress into bloody vomit and diarrhea as their bodies slough off dead cells. Infected dogs are extremely lethargic and will refuse food and water, which will quickly lead to life-threatening dehydration. Dogs with parvo will also have intense abdominal pain and may growl or snap if you touch their bellies. While there are no drugs to kill off parvovirus, dogs that begin treatment in the early stages of the disease normally survive. 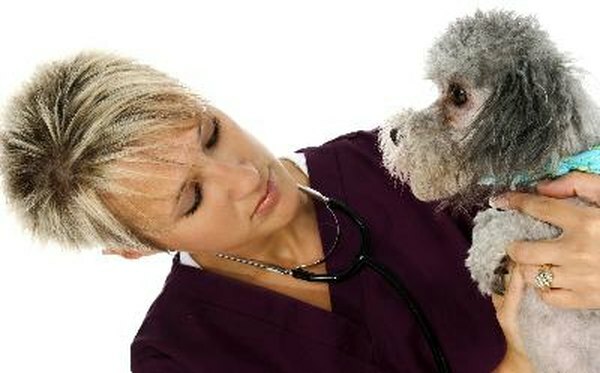 Take your dog to the veterinarian immediately if you suspect she has contracted parvo. The vet will perform an in-office diagnostic test, and if the test is positive for the virus, will immediately administer intravenous fluids to combat dehydration. Your vet will also give the dog medication to prevent vomiting and diarrhea, and will administer antibiotics to fight any infection and boost her immune system. The dog may spend up to a week or more at the vet’s office, and will only be released once she has held down food for at least 24 hours. The single most effective way to prevent the spread of the parvovirus is to vaccinate all puppies against the disease. Puppies are initially vaccinated between 6 and 8 weeks of age, with boosters given every four weeks until the puppies are 20 weeks old. This boosts the immune system and prevents the virus from invading vulnerable cells. Older puppies should also be vaccinated against parvo, although they may only need one vaccine, depending on their age. If an infected dog has been in your home, sterilization is necessary to stop the spread of the virus. Spray a solution of 1 part chlorine bleach to 32 parts water over every solid, non-organic surface. Disinfect all bowls and toys with bleach solution, or throw them away if they cannot be sterilized. Replace soiled bedding with new bedding, and wipe down all surfaces that you might have touched after handling a parvo-positive animal.